Back in December 2014 we previewed an early release of Windows 10 and we have been following things closely ever since. In our testing, Windows 10 has proved to be a worthwhile update, combining the usability and reliability of Windows 7 and the performance, security and functionality of Windows 8. Microsoft have announced that it will be releasing Windows 10 on July 29th, providing Windows 7 SP1, 8.1 and 8.1 Mobile users the ability to reserve their free upgrade via a notification in their task bar. While this has been widely accepted as positive news, this also provides challenges for businesses who need to control the rollout of the update as the end user is prompted to update as above possibly tempting them to update before the customer has tested compatibility with their systems. It is possible to block (temporarily or permanently) the update depending on your system setup, if you wish to do this to give you time to test Windows 10 with your applications before you upgrade or to block the update indefinitely please get in touch. If your machines are “domain joined” they will not receive the update automatically so there is not need to be concerned at this point in time. Who qualifies for an update? Windows 10 Upgrade is available on the Windows versions listed below, which will cover most small to medium sizes businesses who purchase the windows operating system with their new machines, enterprise companies who purchase Windows separately via their Volume License agreement will not be entitled to a free update. 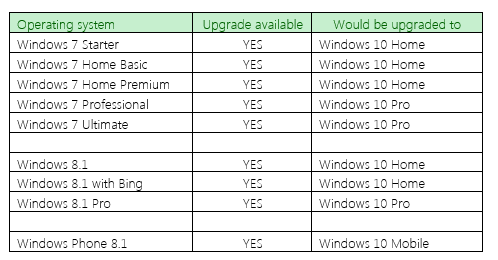 Windows 7 Enterprise, Windows 8, Windows 8.1 Enterprise, and Windows RT/RT 8.1 are excluded from the free upgrade offer, if you are unsure what operating system you are on, this will help. Do I need to accept it straight away? The update will be available free of charge for a year from the release date, after that you will have to pay, but you don’t need to worry about reserving at this stage, there are no limit to the number of free licenses available. Customers who utilise 3rd party or custom written or aging applications should thoroughly test with Windows 10 first. 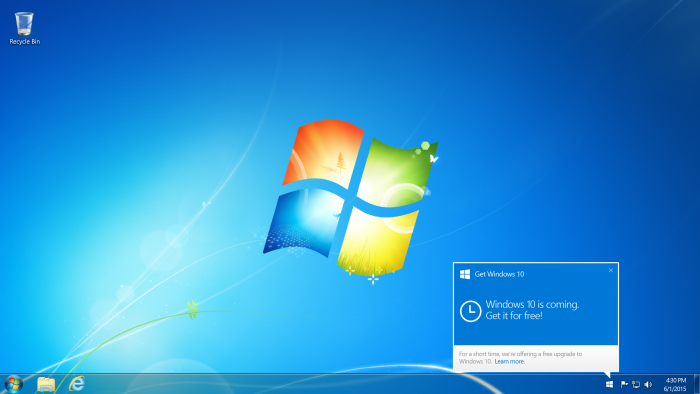 Microsoft have invested heavily in making sure legacy Windows 7 and Windows 8 applications work with Windows 10 but there are no guarantees. Microsoft have been a bit quieter when it comes to communicating any limitations, with Windows 10 you can say goodbye to Windows Media Center, and if your running Windows 10 Home updates will become automatic and will be unable to defer them. Hearts and desktop gadgets will also be missing from Windows 10 and surprisingly those wanting to watch DVD’s will require a third party application to play them although MS have confirmed they will release an update for this later in the year. We will be updating our blog with regular updates of the upgrade process, so if you want to follow the process please check here. Many of our clients use the Cisco IPSEC VPN client software (that little yellow padlock) to connect to their company systems remotely, and this will be no longer supported in Windows 10. Our tests show that it can work on Windows 8.1 but there is no support from Cisco if we have any issues. Cisco have superseded the VPN Client software with their new AnyConnect SSLVPN platform, however this will require an upgrade to your firewall (where compatible) along with an added license cost and SSL certificate. If you are interested in moving towards either Windows 8.1 or Windows 10 then please let us know and we can discuss the options for upgrading of VPN services.